Recently the price per can on the soda machines on campus went up to 75 cents. I drink about 2 cans per day, so the 25 cent increase adds up to a tangible amount for me over the course of a month. On the other hand, a 24 pack of soda is around $7. Along these lines, I used to bring in my own soda and at one point bought a small “refrigerator”. it’s not a real fridge, just a plug in six pack cooler, but it seemed practical for the need. It worked for a while before the cheap fan on the peltier style cooling system crapped out and started making awful noises and randomly stopping. I could have just re-lubed it, but it would have gotten bad again.. so I stashed it under my desk and forgot about it until the recent price hike. 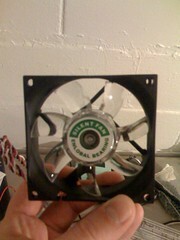 So the other day I dug this guy out and set out to find a quality replacement fan for it. Its a standard 80mm fan, just like computer power supplies and cases, so there were many options. While trying to find the cheapest ball bearing unit available, I stumbled across the Enermax Enlobal which is “bearingless” – the fan blade assembly contains a magnet which causes it to “hover” over the armature. The implications are that there is very much less friction than a traditional fan, and thusly, less power usage and less noise. 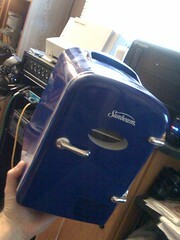 This seemed ideal for my minifridge – I wanted it to be quiet since it’s right next to my desk. The airflow figure was good as well. I went with Amazon, as linked above, since their price was as good as most of the other places I found the 80mm enlobal online and I’ve been on a big Amazon purchasing kick lately. It was $14 and change shipped. The fan showed up earlier than expected, and I went to work putting it in the fridge. The Enlobal has a three wire connector (with a 4 wire adapter included), but my fridge only had two wires, so I clipped the white speed control wire, soldered it up and put some shrink tubing over everything. That’s really all there was to it. I put everything back together and fired it up. True to the marketing materials, the fan moved air and was exceptionally quiet. (I think 14db is the advertised number). So far it works like a champ. I think this is some solid technology that is not only more efficient, and more quiet than ball or sleeve bearing fans, but depending on production numbers could be less expensive than it’s traditional counterparts since it just has fewer parts. Another big plus is that the blade assembly easily pops off for cleaning. All of that along with a MTBF rating of 300,000 hours, this just can’t be beat. Some of my favorite local meals. I’ve been meaning to make this post for a while, but I’m just now getting around to it, prompted by a delicious meal a couple of weeks ago. These are Lafayette, Indiana restaurants, so if you’re not local to here I apologize. One of my favorites for the past year or so is an establishment near campus called Kibu Cafe which specializes in Japanese and Korean cuisine. The most popular dishes there seem to be their huge bowls of noodles. I have a bit of an aversion to extended soup eating, so I’ve not tried them. What I do get though is their lunch special, which includes an entree (Spicy Chicken, Sweet and sour Pork, Chicken Teryaki, Kibu Chicken, or Bulgoki depending on the day of the week) rice, wontons, kimchi, fish cakes and soup. The portion is large and could pretty easily be split, or half saved for left-overs. I have become pretty partial to their soup which is kind of an eggdrop type with cabbage, potatoes and lots of pepper. The sides are pretty excellent too. I highly recommend this to anyone. 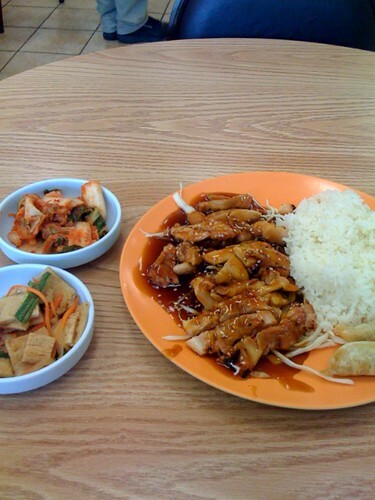 If you are scared of so-called “ethnic” foods, go on Chicken Teryaki day – it’s a pretty safe bet. I don’t even like Chicken Teryaki, but I enjoy theirs. Another more recent favorite is the small, but tasty menu at the Black Sparrow downtown. They started off with only upscale bar appetizers like olive plates and hummus, but have expanded to more robust items. My personal favorite is their take on the cuban sandwich. 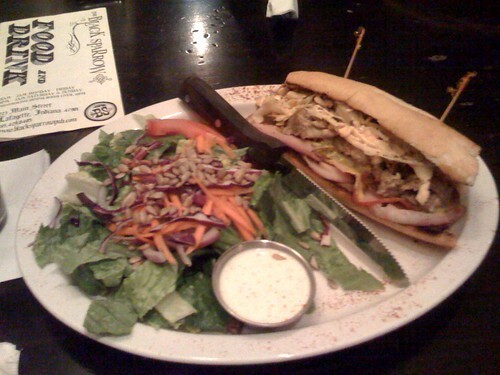 It contains roast pork, sliced ham, swiss cheese, chipotle slaw, yellow mustard and pickle, served on a baguette with fries, salad or soup. I have to say, this has consistently been one of the best prepared meals I’ve had. The pork is roasted expertly. It’s difficult to believe that they do it in house. Also, I went with the salad the last time I got this, and it was remarkably fresh as well. Why I wont buy an iPhone after this one breaks/becomes obsolete..
I’ve been a pretty big advocate of the iPhone for quite some time. I own a first generation iPhone (or second generation as AT&T says, probably as a back track of the 3G designation of the latest phones) and did lots of research on it before purchasing. The main selling point was the UI, and that is still true – it’s slick, looks nice, and for the most part works just like a computer. In the negatives column has two items, and they are pretty big ones.. First, iTunes. I knew going in that I was going to be bound to this. I had hoped that a third party option would surface, but it hasn’t. I can deal with it, but it’s annoying. I want my PC to be less bulky, and iTunes flies in the face of that. Item two, and the deal breaker as far as future purchases: app development is crippled. I’m not even complaining about the non-disclosure stuff that everyone else is.. What I am upset about is limited access to the phones OS. Yes, I understand why apple did it. It’s like a super version of the HAL that came on NT back in the day. Protect the kernel, blah blah blah. Let me tell you why it is bad via a very specific example – NO VOICE DIAL! My previous phone was a freebie moto V551. The software wasn’t awesome, but it had two totally awesome features that my iPhone just can’t come close to. The first, and relatively unimportant in this context was voice record. I held a button and spoke and let go when I was done. Saved. Didn’t have to look at it at all. The important one is the voice dial. I would open the phone, hold the button, say the name, let go of the button and it dialed. Didn’t have to look at the phone AT ALL. You say, “hey, there are voicedialers in the app store!”. You are right, but because the apps can’t access the hardware at a reasonable level, the easy no look process of the moto is a complicated, vision and attention intensive “find the icon, wait for something, do something, wait some more and hope for the best” game on the iPhone. I cannot use this while driving, and frankly, I can dial more quickly by finding the person in my contact list than trying the wonky voice dial. This is not acceptable!!!!!! I drive on the highway regularly and see morons paying no regard to their lane or other cars because they are screwing around with their phones! This is dangerous and a phone with the clout of the iPhone should have features to help prevent that situation from happening. To make things worse, when asked if apple will add a native voice dialer, they disregard the question with the explanation that there “are some in the app store”. DERR, says I. So, I’m not buying this thing again. I think the next phone I get will not be a smart phone of any kind if such beasts are still manufactured when I need a new phone. So I guess my facial hair is at the upper end of thickness/toughness. It’s always given me problems – it’s horribly itchy during all points of “growing it out” regardless of how long I let it go and how much conditioner I put in it, and if I shave more than about twice a week, my neck gets trashed with razor burn and I get pimples from ingrown hairs around my mouth. Yeah, good times. I’ve dealt with this for some time and just kind of assumed that I was doing something wrong. When I started seeing Belinda, the facial hair _really_ hurt her when we’d kiss. I’m no stranger to the idea of beard burn, but it caused her a lot of pain. So, I set out to see if I could remedy the situation. The Gillette Mach 3, despite being the best disposable cartridge razor I’ve used, just wasn’t cutting it. (sorry, pun.) I had tried expensive electric razors in the past with less than mediocre results, but I hit amazon.com to check out Norelcos thinking maybe their circular design would help. Instead, I somehow wound up reading reviews of the PocketGo P-70 Men’s Shaver shaver. It is a single foil, battery powered travel shaver, but the reviews were pretty consistently great. Further, it was less than twenty bucks, so I figured it was worth a shot. Upon trying the P-70 out, I, like the other reviewers, found it to be a formidable razor regardless of price point. It did a great job with my face above the jaw line – I would be happy using it every day for that. It didn’t fare so well on the neck though, which is admittedly the real problem spot. I’ve found that a combination of the P-70 and the Mach 3 give me a shave about as smooth as I imagine I can get. The P-70 is water resistant too, so it’s great for a quick touch up in the shower. In my quest for an even better shave, I also checked out depilatories designed for facial use. There really aren’t many viable options here. Most products I found were targeted at black men, and from the sounds of it, they have a worse time than me with the razor burn. Magic shave seems to be the longest running product of this type, but I have yet to find a positive review of it. Everything I read made it sound pretty caustic. Another product that came up in google and had great reviews was something called Formula 103. A new herbal formulation that at its principal delivered moisturizers as it worked, alleviating the problems generally associated with depilatories. This product was only coming up in product lists on Walgreens websites, but was out of stock there. I did eventually find a store that had some in stock: treasuredlocks.com The price was $5 here instead of the $3 something Walgreens had it listed for, and shipping was another five bucks on top of that. The results? This stuff did absolutely nothing. When I tried to email the company, it bounced. I can’t help but wonder if the reviews were astroturf, the product got pulled from Walgreens because it didn’t work, and the parent company went under. Who knows. All I know is that my steel-like Irish facial hair is too tough for chemicals. For now the P-70/Mach 3 situation is getting the job done, however I would like to try out more traditional razor styles in the future. It seems I have happily embraced twitter, which seems to be the defacto brand name of microblogging, at least in my peer group. I’ve been using it for a while and it’s all well and good. I’ve even added the facebook app that pulls my “status” from it, which is really convenient because it seems that many of my friends regularly check those status messages there. Recently, I noticed that one friend has his myspace status syndicated as well. Wanting the same, I inquired of his method. A service called Ping.fm is the source, offering syndication to just about any site you could possibly imagine sending a status or microblog to. The problem is that Ping.fm needs to be the source of the content. (unless you use a program like spaz for your posting, which has options to export to ping.fm. Apparently a third party is working on a plugin to do this, but who knows when that will happen. There’s also apparently a way to route the RSS from my twitter page to an e-mail which can update Ping.fm, but I haven’t figured out how to make that work yet. A third option would be for me to get off my duff and learn C so I could make a program to sit on the server and fetch the twitter RSS, then do the parsing and checking mentioned above before dumping it to Ping.fm. I will post more as I know it. So I just switched to outlook this week after a longstanding fear of MS products kept me on elm, pine, eudora and thunderbird all these years. Outlook is pretty fun now that I’ve acclimated. Transferring all my old mail (so far I have everything in back to 2001) was pretty easy once I figured out the procedure, which I will share here in case anyone sharing my plight needs it. Fortunately, I’ve always used mail clients that store mail in the UNIX “mbox” format. it seems pretty standard, however, Outlook 2003 and 2007 apparently wont directly import this format. So step one is to convert it to something else, namely EML. I found a program called imapsize which contains this function. (although it does other things too) the conversion was pretty easy: find a mailbox file (the correct ones wont have a file extension, ie: “inbox”) Next add the extension “.mbox” to it. 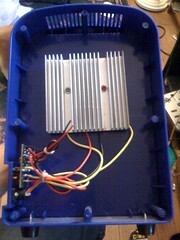 then convert it with the mbox2eml tool. It spits out a folder full of EMLs. The next step is to get the EMLs into something else. Apparently Outlook 2003/2007 wont do it.. at least not in a good way. BUT Outlook express will. You just make a folder in Outlook Express, select all of your EML files in explorer and then drag them into the folder you made. It builds a table of contents, and you’re good to go. Once I had all those in, I needed to get them into Outlook 2007. This part is easy: just use the import tool. All done. Now I can see all my spam from 2001. lol. I made an account and hope to play with this more in the future.